Operation Smile is an international children's medical charity providing life-changing, safe, effective reconstructive surgery for children born with facial deformities such as cleft lip and cleft palate. More than 200,000 children are born with a severe cleft condition every year - often unable to eat, speak, socialise or smile. In the UK, thanks to the NHS, a baby's cleft lip or palate will be repaired in the first year of its life. 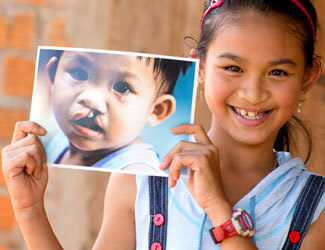 However, in many developing countries cleft surgery is either too expensive or may not be available. Too often, these children are rejected by people around them, afraid to go to school and ostracised by their communities. That's where Operation Smile comes in. Since 1982, - with the help of over 5,000 dedicated medical volunteers - it has provided over 200,000 desperately needed free surgical procedures to children and young adults in over 60 countries, giving each one a new start in life. You can donate your old car to help Operation smile heal children's smiles and bring hope for a better future. Just one car could provide this life-changing surgery and transform a life. Operation Smile goes to great lengths to ensure that every patient treated receives the highest standard of care, providing access to free dental care, speech therapy and counselling where needed. Operation Smile believes that all children deserve to live their lives with dignity and for those born with a cleft lip, cleft palate or other facial deformities, dignity begins with a smile. Donate your car today with Charity Car and do something good for the environment and something incredible for a child with a cleft condition and an uncertain future.